It snowed overnight, but not much. Our folks managed to assemble a few golfball-sized snowballs to toss at us. We chased them. And promptly ate them. 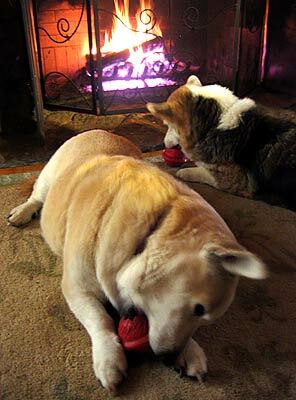 A winter evening by the fire is made so much more enjoyable by the addition of treat balls stuffed with delicious snacks.